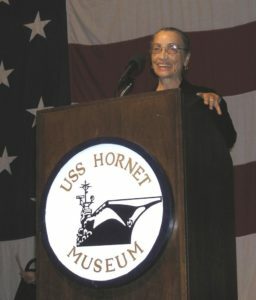 I’ve been a fan/follower of Betty Reid Soskin and her blog for quite a while. 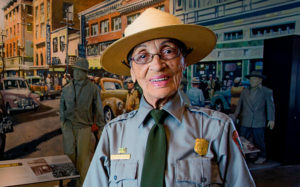 She’s an amazing writer and, at 95, she is the oldest full-time park ranger in the U.S. She’s led quite a life! 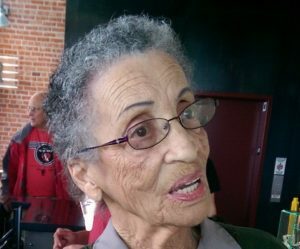 She was in the music biz, was/is a political activist, civil rights champion and was part of the planning & development of Rosie the Riveter/World War II Home Front National Historical Park, where she now serves as a ranger/historical interpreter. She is also into genealogy and her family history is amazing. She’s been blogging “CBreaux Speaks” since 2003. It’s very no-frills site but it makes for some terrific reading. On the left side there are links to some of her other pages and family sites. There are a couple of dead links, but the ones that work are worth a look. Also on the left side is the blog archives, it’s a long list, she writes a lot. How on earth does one respond to the state of the Union? As are we all, I’ve been in a state of shock for a week, and grateful for whatever was built into the human anatomy that allows us to retreat into ourselves for whatever time it takes to recover. That, I suppose, is what we call “shock.” How else can this state of numbness be described? I’m guessing that I’d secretly kept a corner of my mind in enough doubt to retain the capacity to see the possibility that my country might well slip into a period of regression. The hints have always been lurking in there somewhere. We all must have known this, but chose to ignore it. The fact that the electorate had been persistently dumbed down over past decades by a failing system of public education colored by the introduction of reality television being pumped into every home at the sacrifice of the nation’s values and eating away at our cultural base until little is left with which to fight off cynicism and hate of “other-ness” and the empathy needed to support community. Over coming months we may learn the painful lesson that Democracy cannot be sustained without an educated electorate. I suppose I’m less concerned with how the incoming administration will effect our fate as a nation as I am of the ascendance of hatred and bigotry into an electorate that has been inching its way toward forming that “… more perfect Union” over recent decades, and now will be slowed in that progress as we try to figure out where the Ship of State hit this reef! I am fairly convinced that we may be seeing the final frantic defense in the attempt to reinvigorate white supremacy in a fast-changing world. These may be the last gasps as the nation begins to realize and accept that our strengths are in our diversity, and that the inexorable creep toward that realization and acceptance might well be our final chance at eventual salvation. Universal mobility and an irresistible system of communication has made of us one world; a world that might well begin to achieve a relatively peaceful existence, but only if we can come to terms with the urgent needs to save Planet Earth. Just how we will manage to do that when the Evangelicals are now holding the reins of power — good folks who sincerely erroneously believe that the “… scientific warnings of global warming, rising sea levels, climate change, are a hoax created by China”, — and that this global concern is irrelevant since they are hoping to hasten the Rapture when Jesus will return to the world to carry them up to Heaven! How do we deal with the deniers when everything in which they believe has convinced them that scientific evidence is simply humankind’s wasted effort in the face of what they know is profoundly real and biblically verified by myth? How could I have ever guessed that there would come a day when I would view Christianity as a detriment to any hope of sustaining life as we know it? And how can one dare to utter such blasphemy yet feel the ring of truth in the utterance. I recommend reading Ms Soskin’s blog anytime you’re bored. You can pretty much just click on any year in the archive on the left and you’ll find something interesting to read about. We all need to be watchful and wary on election day. 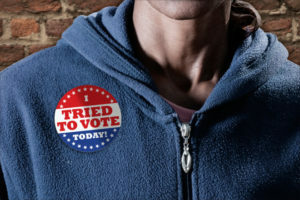 The article linked below pertains to Nebraska, but contains info that may be useful in this hateful climate of potential voter challenge and/or intimidation that we find ourselves facing in this election. As always the most important thing is to get the vote out. Share the information with your followers. 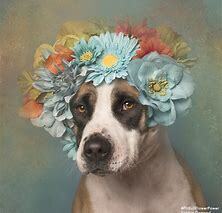 Author GrannyMumantoogPosted on November 5, 2016 November 4, 2016 68 Comments on Attention Trail Hands! I feel compelled to write a piece about the Broadway show Hamilton. The reason is that I just finished watching the PBS special that originally aired on 10/21/2016 called, Hamilton’s America! This is an amazing behind the scenes look at the show, it’s creation and, most importantly, the history of our country. I was watching the Tony Awards in June and was enthralled watching Hamilton win award after award, totaling 11 by the end of the night. I’ve seen various snippets of the show on YouTube and heard most of the soundtrack. I’ve seen/heard enough about it to know it’s something that I’m interested in. I will definitely see Hamilton the moment any local theater group presents it, as I have done many times in the past for other shows. It won’t be the same cast, but the words and the power of the piece should be transferable to any theater production. It’s tough to be a Broadway lover when you can’t get to Broadway, but we make do. If there is anyone who, like me, thinks they know about Hamilton, the musical. If you’ve heard anything about Hamilton, seen YouTube videos, think you know what it’s about, even if you were lucky enough to see in live on Broadway you must watch Hamilton’s America! Not only does it showcase the genius of Lin-Manuel Miranda who is described as a modern Shakespeare, and the other creators and cast, but it’s a history lesson. I would venture to say that it’s one of the best history lessons I’ve ever had about this group of founding fathers. It was impressive how much the cast had imbued themselves with the history of the characters they were playing. I was blown away by how well they not only knew their characters, but how well they understood them, warts and all. I think what makes Hamilton unique is that they show how human and flawed the most revered people in history can be, but they also show that their flaws don’t cancel out the good that they did. There are many familiar people in this program talking about our history and Hamilton, the man and the show. You’ll all be happy to see our favorite Senator from Massachusetts 🙂 She’s brilliant, as always. President Obama has a lot of very eloquent things to offer as well. I could go on, but I don’t want to spoil it. I really want you all to try and watch Hamilton’s America if you can. If you have a Roku, it’s on the PBS station until 11/18/2016, that’s where I watched it. I believe it may also be on the PBS website and may be time limited there as well. It’s runs for 1:22. I hope you love it as much as I did and I’m looking forward to some discussions about the show, the people involved, the history of our country and how this all still applies today and anything else that it moves you to talk about. 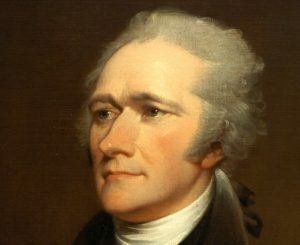 Author GrannyMumantoogPosted on October 25, 2016 October 24, 2016 83 Comments on Hamilton! 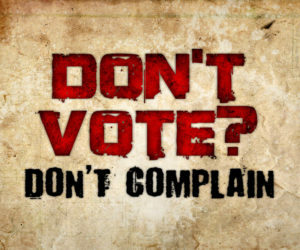 Some recent news articles have shown that there are still people out there trying to mess with voter registration. Mostly they are just using scare tactics by making people think that there is much more voter fraud than has actually been proven to be true. In addition, there are still some people working to get last minute laws enacted to make registrations and voting more difficult. In this crucial election it behooves us all to be ever vigilante and work on behalf of ensuring that everyone who can vote is legally registered! A few days ago, feeling a little paranoid about the state of voter registration, I decided to look into the subject a bit. I discovered that there are wildly different rules, deadlines and methods available for people to register to vote in different states. I learned that my state had a nice online area where I could check my registration status so I did! As expected, I was registered just fine! What I didn’t expect was that my oldest son (Turning 50 Monday yikes!) was not! He had put in a change of address with the DMV some time ago and I remember that I talked with him about making sure his change of address was on his voter reg too. Well, apparently he didn’t do that in time and yes, it turns out that there is a deadline to do it. You can’t just show up at your previously recorded poling place, as he thought he could. His deadline had passed and he was no longer a registered voter! Needless to say I emailed him a link to the voter reg page and he took care of it that day. This got me thinking that I should share this information with as many people as possible. I was amazed to see how many different deadlines exist when you look at the lists by state! This election is too important to leave anything to chance! Here are some links people can use. Two of them are to find out more about voter registration in each state. One is a universal form to use to register online, for people who are not yet registered. If all else fails, people should be encouraged to check their state’s official website and find a page with voter information they can click on! For the most part, there’s only a couple week left to accomplish this. Be aware that some states do not have online registration so voters need to be even more aware of deadlines by mail, determined by postmarks, or in person. Now, go forth, and get out the vote!